Everyone wants to have the peace of mind that comes with having a strong financial situation, but the reality is that many women find themselves unsatisfied with their current financial status. As part of the POPSUGAR Insights 2017 Personal Finance Report, we surveyed nearly 2,000 women between the ages of 18 and 44 to ask them how they manage their finances and think about their financial future. 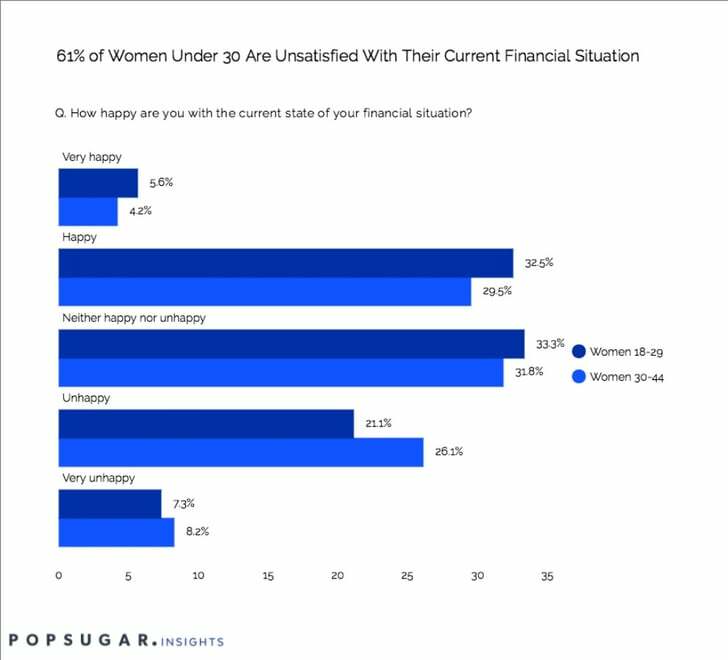 Overall, over 6 in 10 women under 30 and 66% of women between ages 30 and 44 are unsatisfied with their current financial situation. Women under the age of 30 are slightly more likely to feel happy about their financial situation, perhaps due to the fact that they know the reality of having more time to make a change for the better. Women between the ages of 30 and 44 are 24% more likely to feel unhappy about their current status and could benefit from advice on how to better their situation in a short amount of time. There's a tremendous opportunity for brands to help here, by offering advice, tips, and practical tools to help women assess the reality of their financial situation, get in the right frame of mind to improve their status, and help women begin to improve their situation. Examples could include videos of women who were once in similar situations but were able to overcome their financial issues, or advice on how to take action and resolve issues, or positive content to help but short-term, temporary financial pitfalls into perspective.